A surreal celebrity encounter among the sequoias. After leaving the wilds of Big Sur (as I chronicled in last month’s column), my wife April and I continued up the Pacific Coast Highway on our northwest odyssey—through Santa Cruz, Monterey Bay, over the Golden Gate Bridge and onward into the majestic redwood forest. There, we enjoyed a leisurely drive up the Avenue of the Giants, pulling off every few miles for a short hike, a few photos and a serene smoke. As we neared the end of the avenue, we made one final turnoff—into the Founder’s Grove. As we idled down the gravel road in search of a less-tourist-populated spot to get our smoke on, I happened to glance across to my left at an older couple standing by one of the larger trees and did a double take. “I think so … but I have to find out.” I pulled the car around and made another pass. Sure enough, it was him. Almost instantly, his expression morphed from befuddlement to bemusement. I asked if he would mind taking a quick photo with me, and he graciously agreed. But as April raised her iPhone to take the shot, Stone’s wife approached him, appearing concerned, and tried to stealthily take something from his hand. 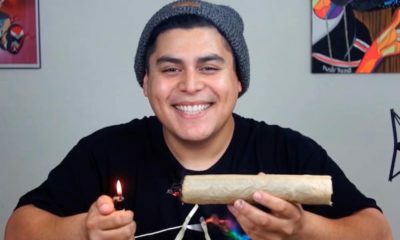 It took me a few seconds to realize what it was: a lit joint! Like us, Stone had sought out a secluded spot to get high. Now—believing we were just some random fans, no doubt—his wife was attempting to sneak it away before we could see it. Obviously, she either hadn’t heard me say where I worked or didn’t understand. In any case, Stone quickly cleared it up. “Oh!” she said with a relieved smile. I was hoping he’d offer me a hit, or at least hold it up for the photo, but no such luck. And despite his outward civility, I could tell he was ready for us to go. April and I spent the next few hours—hell, days—marveling over the surreal encounter. Five more minutes hiking, or five minutes less at breakfast, and we surely would’ve missed them. Upon hearing the story days later, a friend responded, “Wow—how random!” To me, however, it was the opposite of random. “Synchronicity,” said the visionary psychologist Carl Jung, “is an ever-present reality for those who who have eyes to see it.” Or, to put it another way: I can see the forest for the trees.